The Storm Prediction Center issued an enhanced risk for severe weather today near the center of the low pressure system, which is where the greatest risk for severe weather usually lies in a situation like this. As expected, the thunderstorms bubbled up along and ahead of the cold front as it collides into warmer, more unstable air to its east. As of 4:20 PM CST, the SPC has received three tornado reports, more than 30 reports of wind damage or very strong wind gusts (one gust reached 80 MPH in southwestern Iowa), and a couple of reports of large hail up to the size of golf balls. All of the tornado reports so far have come from Iowa; the air traffic control tower at Des Moines International Airport reported a tornado on the ground near the airfield at 3:30 PM CST. The Des Moines Register reports that a possible tornado in Corning, Iowa, damaged a holding tank and triggered an argon gas leak at an industrial plant in the town. The paper reports that another possible tornado damaged structures in Ringgold County, located on the state’s southern border with Missouri. No injuries were reported in any of the three possible tornadoes. This line of severe thunderstorms will continue moving east through the night, eventually reaching most cities in the northern half of Illinois. Once the sun sets, though, instability will start to wane, so it remains to be seen if any formidable storms will survive to see Chicago. If they do, though, the main hazard would be damaging winds with an outside chance of a quick tornado. The central Rockies and their eastern slopes saw a pretty blanket of snow last night, snarling traffic and closing schools (okay, so maybe it wasn’t pretty to everyone). 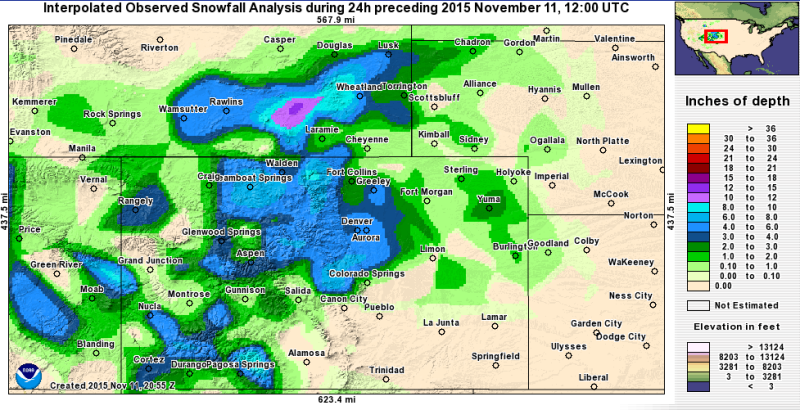 The latest analysis from the National Weather Service shows a solid coating in the Denver area, with four to six inches a common amount with locally higher totals in spots. 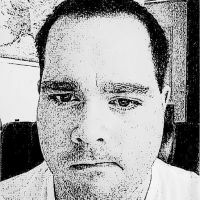 As the low pressure system rapidly developed and started to move across the Plains, the cold air and snow followed suit, and there’s a shield of pretty heavy snow covering central Nebraska as of the writing of this post. Many spots seeing heavy rain and thunder right now will quickly chill as the low passes to their east, and cities as far east as Sioux Falls, Sioux City, and maybe even Omaha could see the rain change over to a quick burst of snow before the system pulls away. This low will continue to deepen and grow in size as it moves toward the Great Lakes, and the air is cold enough that northern parts of Minnesota, Wisconsin, and the U.P. of Michigan should see a few inches of snow on Thursday night. 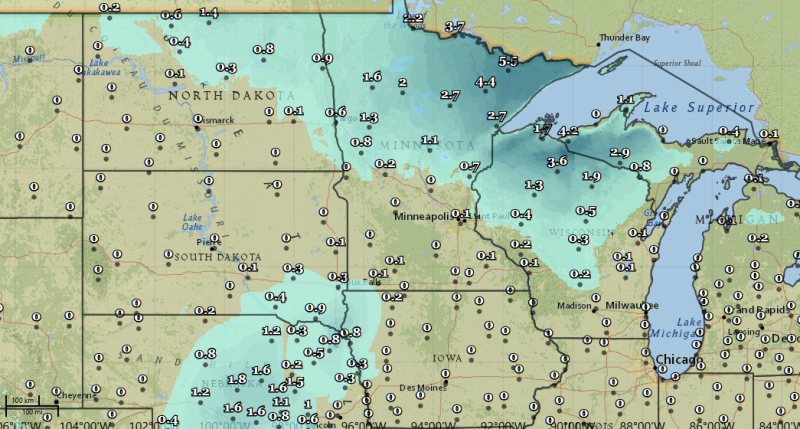 The above map shows NWS forecast snowfall totals through Friday evening. High wind warnings and wind advisories in in effect from Oklahoma to New York, with the strongest winds likely to unfold around the Great Lakes around the southern half of the low. Winds can build up speed more easily over water than land because moving air encounters less friction over the open waters, so winds on the eastern shores of the lakes could cause damage to some structures right on the coast. 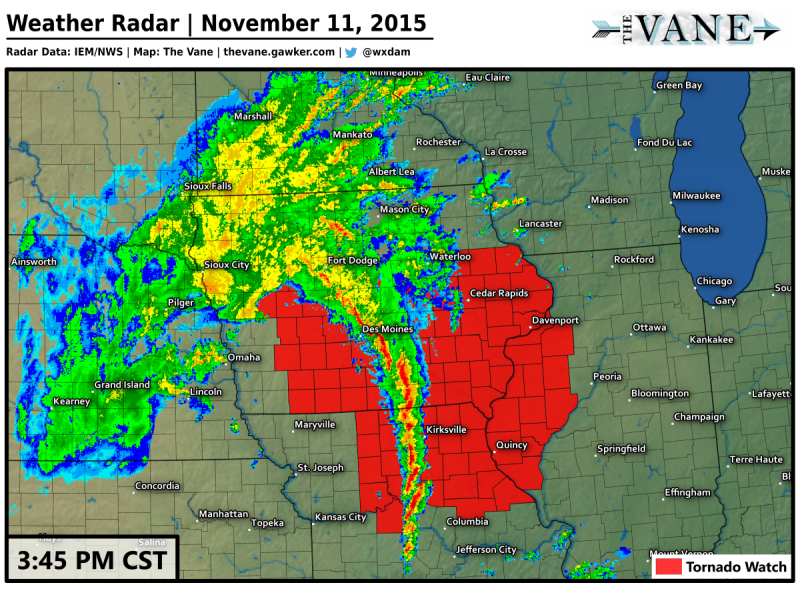 If you’re sensitive to noise, you aren’t going to have an easy sleep tonight in the Midwest. 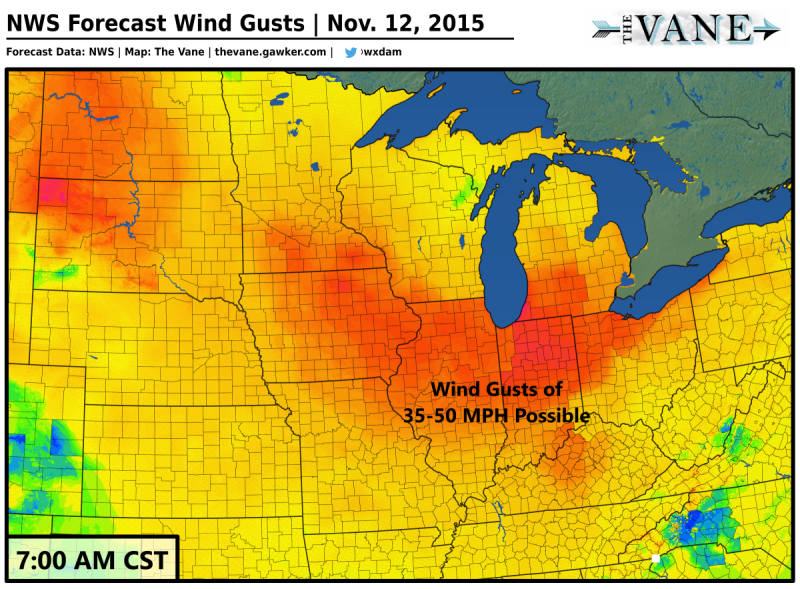 The National Weather Service expects widespread wind gusts of 35-50 MPH, with even higher gusts likely in some spots. The above map shows their wind gust forecast for 7:00 AM CST on Thursday; warmer colors indicate stronger winds. 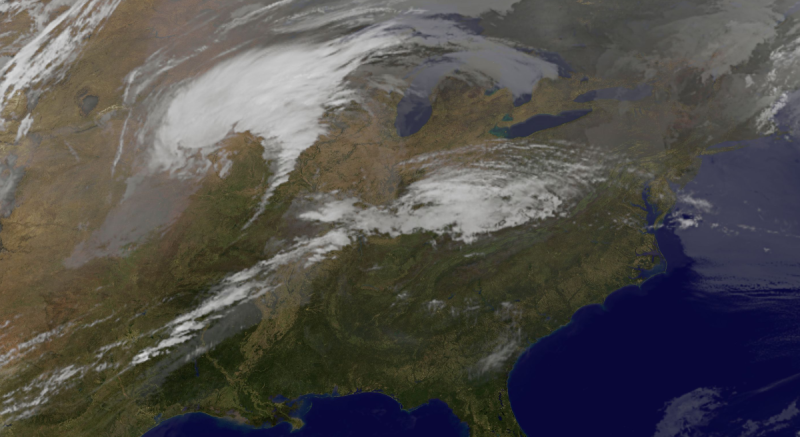 Meteorologists predict the howling gales to stretch from Minnesota to Ohio around rush hour on Thursday morning, stretching eastward with the movement of the low. Be careful if you have a high-profile vehicle and have to drive with a crosswind. As I mentioned yesterday, this storm marks just a brief pause in our Septemberest November Ever, where just about everyone in the eastern half of the country has experienced temperatures well above where they should be in November. It feels like September, and soon after this storm exits stage right, above average they’ll return. Next week, however, the models are painting an even hairier storm spiraling into existence in the southern part of the United States. 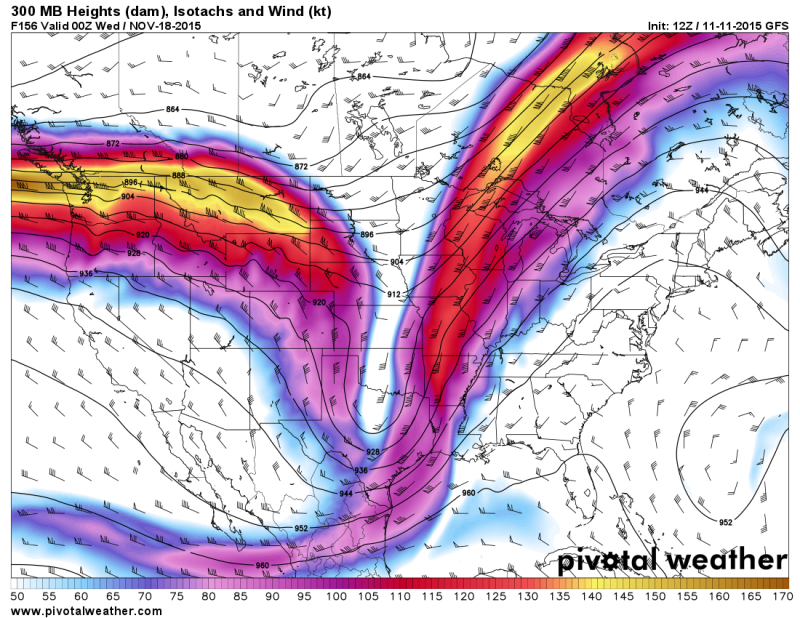 This morning’s run of the GFS model depicts an absolutely beautiful trough in the jet stream next Wednesday, and what this feature decides to do could trigger some rough storms in the Deep South. This is a full seven days out—if this were snow, we’d make fun of the forecast—but it never hurts to keep an eye on it. No matter where you live or what you’re experiencing right now, make sure you always pay attention to severe weather watches and warnings, providing yourself with multiple sources for weather information in case you lose power or cell service.